The Show #84.5: Hour 3! A new feature only available as a download! The cast of “The Show” broadcast the first two hours and stay in studio to record the third! 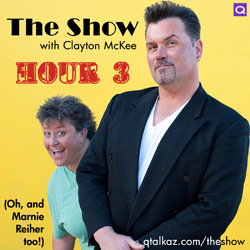 Join Clayton, Buddy, Al and Marnie and they give a little more conversation, humor and drinks in this “Hour 3? of the most off-the-rails show on the network.